Josh is looking to put his recent loss to St Pierre behind him and come out fighting. The fighters size each other up and then Hazelett lands a big kick to the head of Koscheck. A follow up knee lands and Koscheck is in trouble. Josh does land a few fists defending himself and fends Dustin off of him with a few good lands. They continue to trade. When against the octagon, Hazelett jumps into a guillotine and holds it for about 20 seconds before having to let go. Hazelett lands a kick, Koscheck returns the favor. Dustin lands a great knee, Koscheck a right hand. These guys continue to land solid punches and both, in turn, absorb the punishment and stand strong. 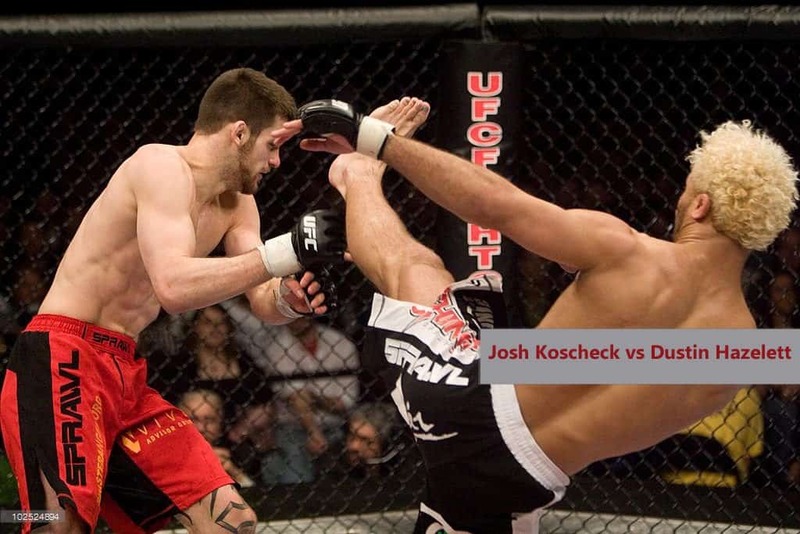 Koscheck gets a huge takedown, but Dustin flips into a triangle and puts Josh in trouble. Saved by the bell, round 1 comes to a close. Round 2 starts with the fighters resizing each other. The first minute is full of jabs and a few misses. They each try to land kicks but neither do, until Koscheck does manage to land one on the temple of Dustin Hazelett. Tasting blood he jumps Hazelett and pounds him until the ref comes in to stop the fight.